Every good parent knows that raising respectable, upstanding children requires love, integrity and the periodic dose of deceit. Marketing, peer comparisons and shiny, new things influence kids, just as they do adults. 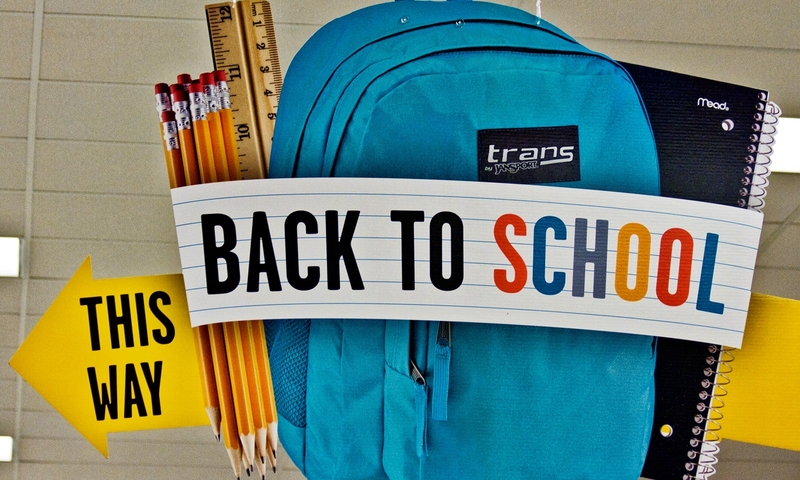 This is extraordinarily evident during this period that retailers like to call Back to School. To hear J.C. Penny tell it, everyone needs a new everything before that first recess bell rings in the classroom. We at Nikwax welcome all kids – young and old – to be part of the environmental and social solution by investing in the longevity of our purchases. We are proud to be 100% fluorochemical free, thereby providing safe alternatives for your in-home cleaning and waterproofing. With so many formulas to choose from in the Nikwax line-up, your biggest challenge to keeping your kids’ outdoor gear in good shape will be how fast those little people tend to grow. Buy less, experience more. Exhibit A: What once was old is new again. Teachable moment: Look! You finally get to own the rain jacket you always used to “borrow” from your older sister. It’s all yours and she’ll have to ask you if she can borrow it now. What kids hear: Take your sister’s gnarly old slicker. You’ll never have anything nice. Positive spin: Restore the piece with some Nikwax gear rehab (we suggest Tech Wash and waterproofing), and then customize it somehow. Sew a sweet patch on it. Write the new owner’s name in permanent marker on the inside. If all else fails, pull a “Portlandia” and put a bird on it. Lesson learned: Dignity is not found in amassing “stuff,” it’s found in honoring everyone and everything around you. Reusing and repurposing should be the norm, not the exception. Exhibit B: Yes, dear, of course your beloved [insert item here] is still good. Teachable moment: If you want [item] to last, you need to care for it. Just like you need to feed Mrs. Goldfish so she stays alive, it’s important to take care of your things if you want them to continue to work. What kids hear: If something isn’t working mom or dad will fix it. Positive spin: If you want a puppy, you’re going to have to show me that you can take care of the things you already have. Specifically, please show me that you know how to use the washing machine and how to read your clothing tags. Lesson learned: It’s easier, less expensive and far less wasteful to care for something well, than to replace it with something new. Categories: Environmental, Gear Care, Stories | Tags: back to school, Nikwax, Reduce, Reuse, Tech Wash, Waterproofing | Permalink. The ball crosses into the End Zone. High fives and cheers surround you. Someone picks you up and raises you over the crowd. A cooler full of Gatorade pours down over your head. That’s not Gatorade. You didn’t score the winning touchdown. You’re in the parking lot listening to the big game on the radio with the rest of your fellow coeds who would rather save money for tuition, books or a ski pass. And don’t fool yourself; that was a can of PBR your buddy shook over your head. 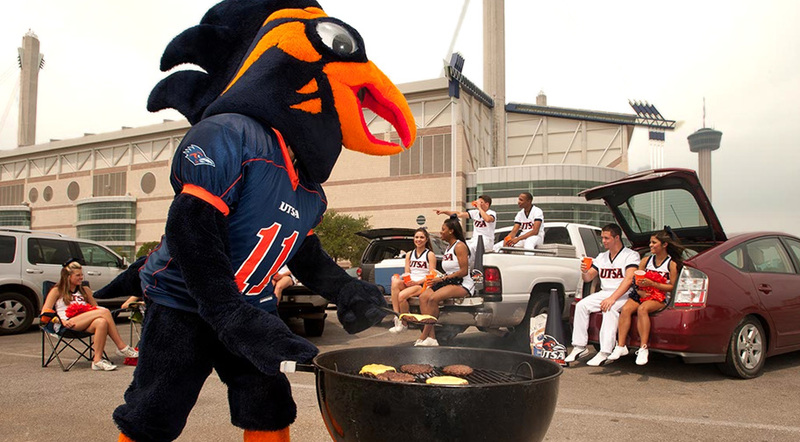 Just because you’re not throwing down for tickets at the fifty-yard line, doesn’t mean you’re not going to tailgate with the best of ‘em. Tailgating is an art, albeit an interpretative one. There are a few non-negotiables: a cooler, a barbeque within a three-car range, some body paint, beer (or sodas, naturally, for the parents who are reading) and a die-hard attitude. Tailgaters don’t give up if sun beats down. Tailgaters don’t run for cover when the skies open up. You are a tenacious breed; you are a fan. For ice, go cubes only, no blocks. The barbeque? Charcoal hibachi all the way. Body paint is up to you, but please remember photos on the Internet are forever. Where does Nikwax come into the ritual? Nikwax gives you the confidence of knowing that you’ll be dry and comfortable regardless of what the skies serve up. Whether you show up to campus with the swankiest waterproof/breathable jacket, or you pack your trusty fleece pullover that’s been with you since your Sweet 16. We’ve got you covered. 1. What Nikwax product should you use to waterproof your outerwear? 2. Is applying Nikwax as easy as running a cycle in the dorm washing machine? Let’s hope that’s not a duplicate to your first semester grades. You are now tested, proven and ready, uber fan! Waterproofing for game day may mean protecting your outerwear for more than inclement weather. We’re just sayin’. So save money, be confident and suit up. There’s a game going on and a bratwurst with your name on it. Get out there and have fun. Your team needs you to be worry-free, come rain, snow or carbonated adult beverage. Categories: Events, Gear Care, Stories | Tags: college, fleece, Footwear, footwear care, How-to, rain jacket, water repellent, Waterproof | Permalink. 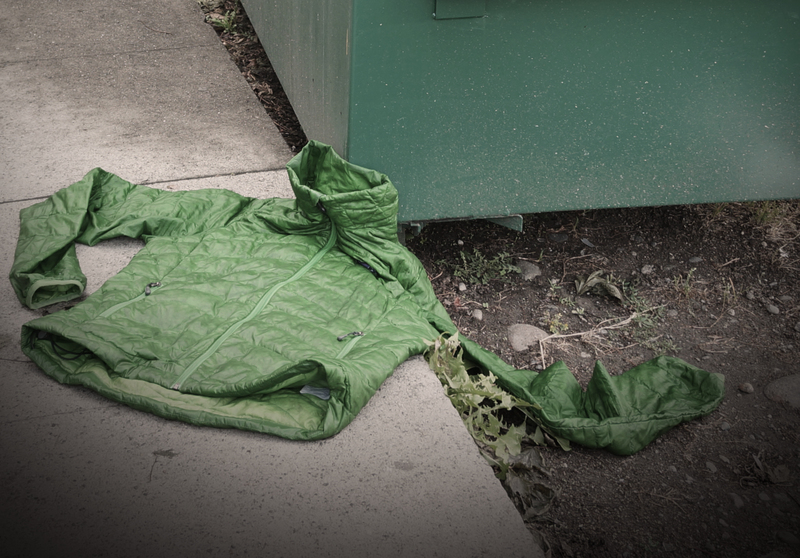 Just like “Old Yellow,” this faithful jacket was abused and forgotten—for a while. Fortunately, we salvaged it before it crawled into the dumpster. The smell was ungodly. Every time I cracked open my dry bag, the stench brought tears of disgust and pain to my eyes. At first, the smell just made me feel a little dirty – nothing over the top. It wasn’t until Day 13 of a 16-day mid-August Grand Canyon river trip that I realized the bag had taken on a life of its own. This odor was different. It wasn’t just unpleasant; it was downright rancid. While I recognized something was amiss, I ignored the warning signs. But on that fateful day, the sky opened up and the first rain shower we’d had since the put-in sent us scattering to grab rain gear. I excavated my cherished lemon yellow raincoat from the offending bag. Some background: I had coveted this coat since childhood. It was a classic happy yellow, just what the Morton salt girl would wear if she were a Gore-Tex junkie. This coat was my partner. One time, its near-neon yellow visibility saved a group of 30 tourists from careening off a cliff on fog-encased glacier in Switzerland. True story. It held up on a backpacking trip to hell and back. It was neither flattering, nor stylish, but I loved this raincoat with all my heart. As the rain pummeled us, I slipped it on without a care, though I couldn’t help gagging on the smell. “Dummy,” I thought to myself. “You put a damp coat into a compressed dry bag for 13 days in 100-degree heat. It’s molded and ruined!” It was moldy, alright, but this mold had nothing to do with being put away wet. This mold was the result of absolute neglect: a slice of cheese and a dry bag warming to incomprehensible heat in the hot Arizona sun. You see, the night before the put-in on a raft trip is always hectic event, especially in the rain. You’ve been planning the trip for ages and you’re jockeying to rig boats. When I picked up the cheese slice that someone dropped, I threw it in my pocket… until I could make my way to the garbage cans. At least that was the plan. I’ve not researched the full catalog of fibers cheese mold can adhere to and successfully colonize, but I can now say with confidence that waterproof/durable, lemon yellow raincoat fiber is one. In the petri dish of a rubber dry bag, heated to a consistency far above average body temperature for a fortnight, that mold will not only survive, it will flourish. Too mortified to tell anyone that I’d been conducting inadvertent chemical experiments the entirety of our trip, I stealthily pushed my raincoat into a plastic trash bag and rode out the remaining three days of the trip with a lingering odor that people noticed but were too kind to mention. Back at home, there were only two options for Old Yellow: the trashcan or the washing machine. First, I turned the jet hose on it. The stink was stronger than my will. As a last ditch effort, I threw it the washing machine and poured in some Tech Wash, as that was my habit. Had I stopped to think about it, I would have poured in the most toxic stink-fighter I could find. Instead, I berated myself for “wasting” the Tech Wash.
One wash with Tech Wash gave me hope. We weren’t in the clear, but you had to bury your nose in the jacket in order to smell the cheesy aftereffects. The second wash brought the world back into equilibrium: zero stink and no evidence of mold. The third wash was really just a hopeful attempt to erase the mold hangover in my mind. Categories: Gear Care, Product Information, Stories | Tags: base layers, Gear rehab, nature, Nikwax, Nikwax BaseFresh, Outdoors, Waterproof | Permalink. I saw you at a Seattle 3-Step Gear Rehab support group. You were wearing a purple 2-layer jacket, but you called the color eggplant or cabernet or Manchurian sunset or something. Me: I was wearing a pair of jeans with a short-sleeve plaid button up and flip-flops. I was shy. You were so beautiful. Your strong, calloused hands looked like you may be my manic-pixie-dream-climbing partner. You: Alone, sitting just outside the circle, because you were ashamed of the dirt and your raincoat’s obvious failure to keep water out. I hope it’s not too presumptuous to say, but I’m proud of you. Admitting the problem is the first step. Showing up is like step 1.5. I’m here to tell you: it gets better. My gear is six months clean now. It’s only four months proofed, but hey, you don’t need to proof as often as you clean! At my first Gear Rehab meeting, I was a skeptic. “Put your proofing where your mouth is, Nikwax,” I said, because I’m not worried about mixing metaphors. You know what? They did it. Well, they didn’t actually drink the waterproofing, but that’s not important right now. You know what’s important? The fact that the 3-Step system works. Admit your gear needs help. Clean it. Keeping gear clean will keep it at peak performance. Waterproof it. Nikwax formulas are non-toxic and fluorocarbon-free, so they are safe for home use and not harmful to the environment. These three steps are the reason I didn’t splurge on thousands of dollars of new gear I couldn’t afford. They’re why my gear looks as good as it does. They are solely responsible for my gear’s improved performance. Hell, they’ve helped me break my addiction to consumerism! Oh boy—I sound like a zealot. I kind of am. When you figure out how you want to spend the rest of your life (having adventures in gear that works) and the woman you want to spend it with (umm… you), you want the rest of your life to begin right away. I hope to see you at the next 3-Step Meeting. If you decide to send your cabernet Manchurian raincoat to Nikwax for the Gear Rehab program, please, please, please respond to this missed connection and we can climb into the sunset together. *All gear addicts and Gear Rehab support groups mentioned above are fictional. In the non-fiction realm, Nikwax will clean and proof your gear in-house and for free – all in the name of making you a believer. Not to confused with Beliebers. We have no vested interest in that. Check out all the details here: http://www.nikwaxna.com/gearrehab/. Hey! Back to School shopping: we’re talking to you. You represent the end of the dog days more than Labor Day, more than the equinox and even more than the plummeting mercury in our thermometers. We may be excited for the kids to expand their minds and unleash their daily dose of energy. But as adults, we refuse to accept that summer ends when the school bell rings. 10. Let your kids plan the Labor Day Weekend festivities. Three days. Ideal temps. Unlimited imagination. Set a few parameters (or not) and let them come up with their dream way to spend three days. We bet they’ll surprise you with outdoor fun. No kids? Easy. Make your own Labor Day plans with the same unlimited imagination and zeal for adventure. 9. Wake up early. Say what? Summer is supposed to be the season of relaxation and sleeping in. But as the daylight hours shorten, waking up early is the only way to maximize the sun’s Vitamin D-giving goodness. Bonus: if you live near the ocean, the waves are probably getting bigger. If you live inland, consider early rising training for dawn patrol skinning sessions and blissful morning skate skis. 8. Barbeque. There is a caveat: you must use charcoal. Propane grills score for efficiency, but nothing smells of summer like charcoal. Bonus points if you take the Hibachi to the beach or local campground. 7. Pull out your favorite sweater. 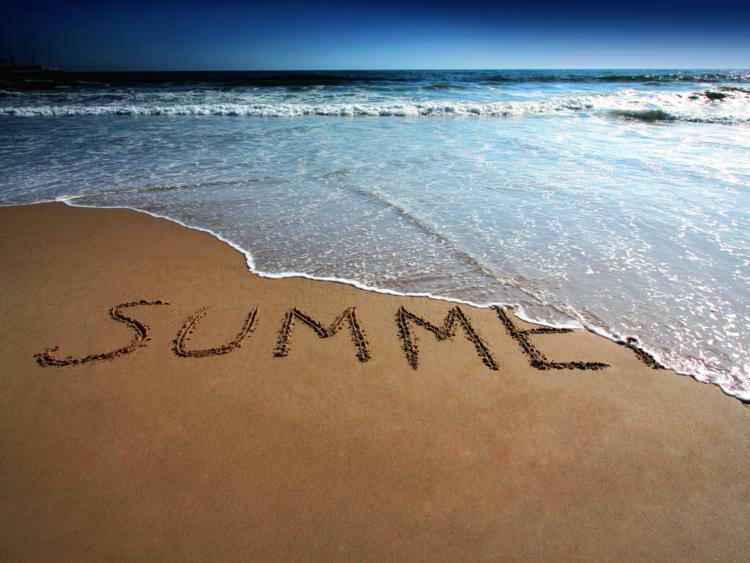 This may be counter-intuitive to the goal of celebrating summer, but hear us out. After months of hot weather and hiding from the heat, how good does a little chill feel? Really good—for few minutes. Pull on your sweater and cozy up in your big bundle of warmth. Consider this tip your Zen practice for living in the present season. 6. Explore your local wilderness. Summer tends to be the season of extravagant, faraway trips. How much do you know about the wilderness within a four-hour drive of your home? Select one cardinal direction for each of the next four weekends, pack your tent and sleeping bags and hit the (local) road. 5. Nest. Every other animal is busy preparing for winter. No, don’t pack on mega-pounds for hibernation, à la black bears. Instead, think of nesting as organization. When your 3-season tent has seen its last workday for the year, air it out, treat it with Tent and Gear Solarproof and pack it away. Pull out your cold weather gear and proof it for the season. Most manufacturers, as well as retailers like REI, have online recommendations for the proper way to pack and store your summer gear for winter. 4. Celebrate the regional season. 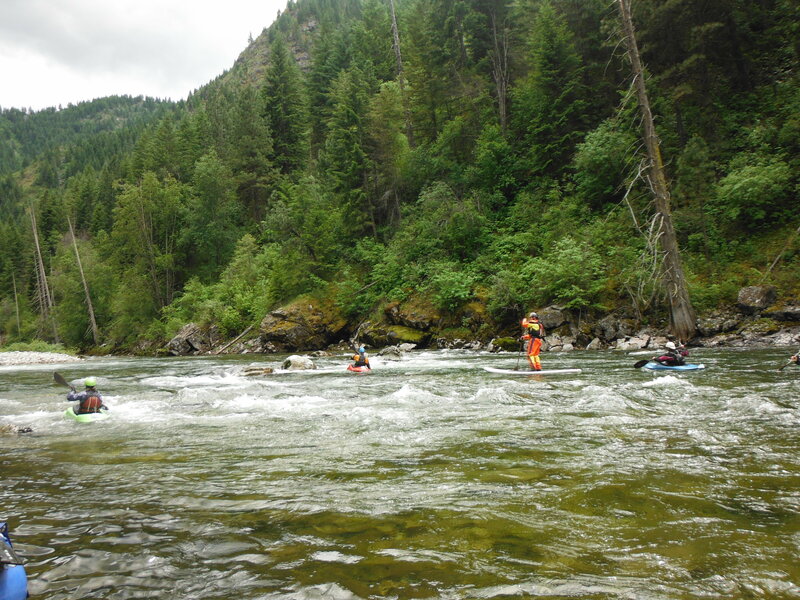 In the Pacific Northwest and the Southeast, it’s river and creeking season. In the Southwest, the Rockies and the Northeast, it’s mountain biking time. Most of us choose where we live based in large part on weather. Get outside and enjoy whatever weather your hometown is throwing at you. 3. Set a winter goal and build a foundation now. Do you want to run a marathon in January? Classic ski the 54K American Birkebeiner in February? It’ll be a whole lot easier to start your training in gorgeous late summer weather. 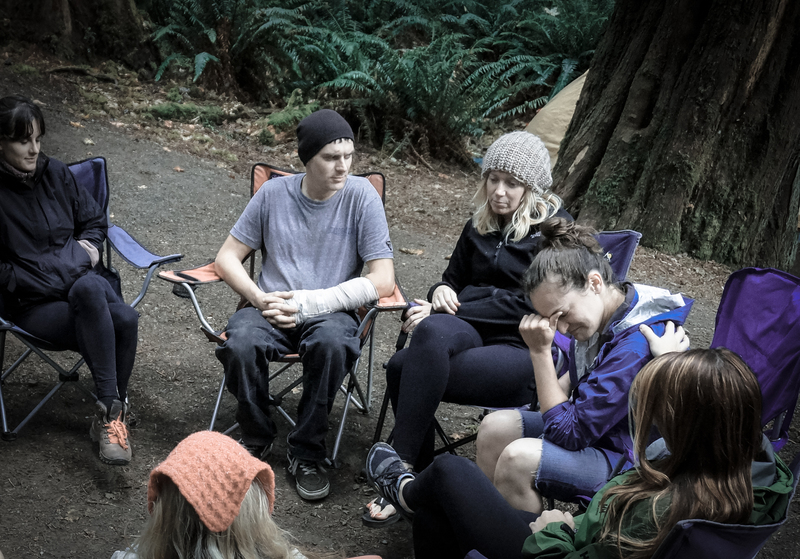 Maybe you can throw a barbeque (see Tip 8) at a nearby campground (see Tip 6) and inspire a group of friends to do it with you. 2. Garden. Are you lucky enough to have your own plot in the backyard? Celebrate harvest season with seasonal meals and canning parties. No space or no green thumb? Volunteer at the local community garden. It’s an important time to prepare the soil for next year’s planting. It’s not as glamorous as sowing the seeds, but turning soil is great exercise, outside fun and connects you to the community. 1. Spend every available minute outside. Some days, especially with kids back in school and daylight waning, you have neither the time nor the energy for an elaborate outdoor adventure. Instead of feeling guilty, just step outside. Sit on the deck or walk around the block. Heck, grab a cold beer and appreciate this life you’ve built. Raise your glass to your family, your friends and another beautiful summer. Cheers… to the good life! Categories: Events, Gear Care, Stories | Tags: adventure, barbecue, mountain bike, ocean, Outdoor, Outdoors, summer | Permalink. I married a fly fisherman, despite having no interest in fly-fishing. I even managed to avoid the sport despite spending the last 18 years on a river in Colorado and working as a professional raft guide. For 40-some years on the planet, I maintained a sterling 0-for-0 record in the fish department. The Selway River would prove my undoing. Located in Central Idaho in the midst of the Selway-Bitterroot Wilderness, the Upper Selway River is a 47-mile stretch of crystalline water, cedar-scented shorelines and impossibly steep and green hillsides. Most forest fires there are allowed to burn because they are simply too remote to reach. Only 63 permits are given out each year, making it tougher to snag a trip on this northern beauty than just about anywhere else. My husband and I accepted the invitation before the words were fully out of the trip leader’s mouth. We’d been trying to get a permit for 18 years. But when we were a week away from departure, I was hesitant. Though I’m a competent rower, I’d spent more time recently pushing keys on the computer than pushing oars. I blame Pam Houston for my lack of enthusiasm. She ruined me for the Selway in her instant classic “Cowboys are my Weakness.” I read her harrowing story in 1995, the same year I started guiding commercially. She misguidedly ran the river at particularly high water – all in the name of love or lust or something like it. I don’t remember the details other than the endless string of boat-flipping holes and back-to-back, boulder-choked rapids. In 1995, I was intrigued. In 2013, I was not feeling at my most confident. 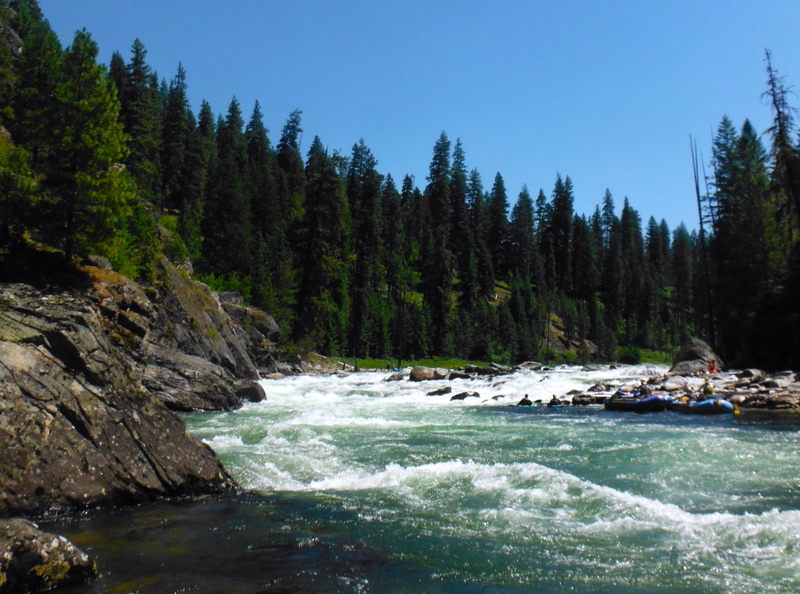 Thanks in large part to a friendly water level, the rapids on the Selway were long on fun and short on scary. We all had clean runs and the people, most of whom I’d never met, proved an amiable and competent crew. My husband and I were enjoying more laughs than we’d shared in months. The Selway corridor is at once intimate and imposing. It’s a narrow river flanked by towering, steep slopes smothered in lush, green trees. I was attuned for sightings of bears and rattlesnakes. The only land animals we saw were a few eagles and osprey, plus a butterfly that took up residence on my bare arm for nearly three hours one day. The water is so clear you find yourself pointing it out multiple times a day, as if to confirm what you’re seeing is real. And, of course, there were the fish. I’d been studying them for days. As I pushed out of an eddy, I sheepishly asked my husband if he would row so I could try out his fly rod. Barely concealing a pleased smile, he dutifully tied on the appropriate fly and I was sunk. When it happened, it happened fast and I squealed like a little girl. “I got one! What do I do? Am I hurting it? I don’t want to hurt it.” Whereas fishing brings out the Zen in most people, apparently it brings out my bossy and high-pitched side. And it is remarkably fun. In an instant, I fell in love with this surprisingly graceful dance of gently touching the fly on the water and playfully tempting the fish to bite. I couldn’t NOT catch a fish. One after another, I would reel them in and my husband – the saint that he is – would carefully release them off the barbless hooks. I must have caught 20 fish that first half hour without touching a single one with my hands. Though I wouldn’t stop casting, I was conflicted. Every time I’d feel the tug of the line, instant remorse washed over me. I would reel in the little guys and become overwhelmed with the cruelty of snagging them with a hook purely for my own sick pleasure. When I think of the Selway in the future, I’ll be grateful that we weren’t running it high water. I’ll talk about the middle line in Ladle, sautéing fresh morel mushrooms scavenged from the hillside, and maybe plan to run the 50-mile trail that parallels the length of the stretch. I’ll have to mention the clarity of the water, which could easily be transplanted to a pristine cove in the Caribbean if the colors were more tropical. And I’ll talk about fishing, but not too much. There was an instant connection with the fish on the Selway. It’s one that I’m a bit ashamed of because I’m not sure I want to risk ruining the experience by ever fishing again. Maybe my childhood belief that I could communicate with animals isn’t that far-fetched. Maybe those fish opened my eyes to a glorious river I hadn’t fully been appreciating. Against all logic and contrary to all my guilt, I like the thought that I may just be a natural. 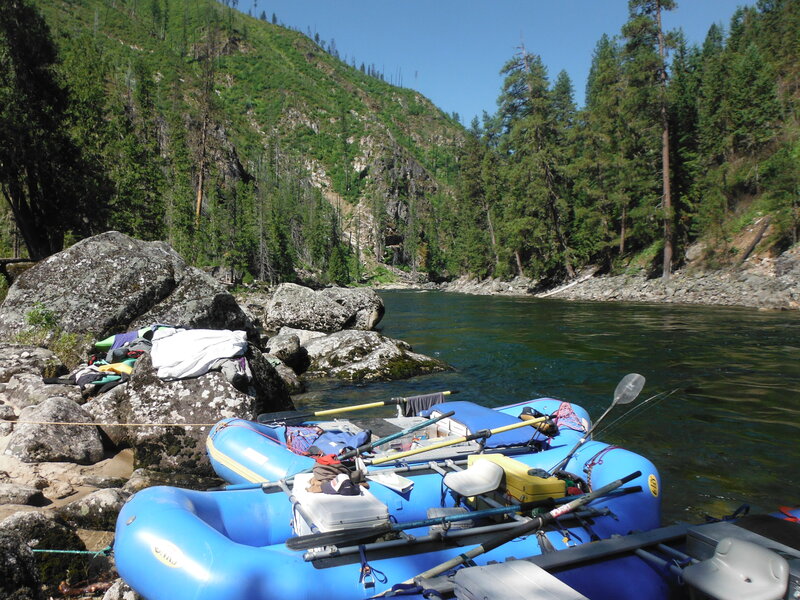 Categories: Stories | Tags: adventure, Fly fishing, Idaho, Nikwax, river trip, road trip, Selway River | Permalink. Three-year olds know the ultimate secret to a successful road trip. Pull over, get out of the car and play at least once every three hours. This was a valuable lesson learned from an actual preschooler… under the duress of a marathon drive, I might add. Beyond slowing down to smell the roses and always stopping to take pictures atop roadside, plastic dinosaurs (no exceptions! ), a good road trip is all about a little advanced planning and the right frame of mind. Nikwax is your one-stop source for advanced planning when it comes to your gear. You’ll be proud of yourself for taking the time to reproof your rain gear when an unexpected low-pressure system follows you across the country. Your feet will thank you for the protection when you treat your leather boots before heading out on a new trail every day. Everyone from Clark Griswold to Starwood Resorts has tips for the perfect road trip. Since we’re always out to get off the beaten path anyway, we’ve come up with five little discussed tips that will improve any road trip – from basic to luxury. 5) Always lock valuables in the trunk of the car. Seems like a simple idea, but this little story we stumbled upon illustrated the importance of follow through. If you’re like us, you’re in denial that the Car Talk guys are going off the air. Fortunately, their website is still live and filled with pearls of wisdom, such as: if you drive a convertible and opt for a Speedo as swimwear, trust your instincts over your fellow man and keep an extra set of clothes locked in the trunk. Read how a Car Talk listener came by this helpful tidbit here. 4) When you’re the passenger, you have three responsibilities: play good music, navigate with confidence and don’t stink. The first is subjective, the second learned, and the third is just gross so no one other than juvenile boys (and apparently us) brings it up. Nikwax can’t have your back for all the ways you may stink, but we sure do on two of them. Pack a small tube of Basewash Travel Gel so you can give a quick and easy wash and refresh to your clothes on the road. Also, toss in a some Sandal Wash in case the air conditioning goes out or your flip flops go on strike. 3) Bring. A. Map. Remember those paper things that you could never refold the same way twice? They still work. On a recent road trip to Central Idaho, no fewer than eight of us had our heads bent over our smartphones futilely searching Google Maps for an old Forest Service Road. Technology’s great. But getting off the beaten path will hopefully take you far away from a cell signal, too. 2) Buy a big, rubber box and create a car camping kit. Okay. This one may be a bit indulgent if you already have backpacking gear and a river kitchen and separate groupings of gear for every outing you enjoy. Trust us. This kit will pay for itself in usage days over a short period of time. Keep a checklist in the kit, so you don’t forget those little luxuries, like: gas for the stove, matches or toilet paper. 1) Stop at all the weird, wonderful places and “points of interest” that pique your fancy. 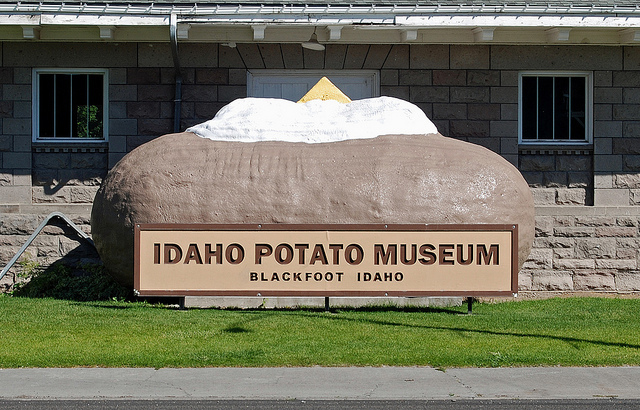 You will never regret stopping at the Idaho Potato Museum or running down the hill where the Wright Brothers first took flight in North Carolina. Even if you’re not traveling with a toddler, listen to the kid inside of you who is joyfully looking out the window and wanting to jump into every experience with both feet, an open mind and a heart full of laughs. Categories: Gear Care, Stories | Tags: Base Wash, road trip, tips | Permalink.